Three years after leading Aero, Arild Andersen’s Masqualero outfit—by now a quartet with Jon Christensen on drums, Tore Brunborg on saxophones, and Nils Petter Molvær on trumpet—returned to ECM’s Rainbow Studio with a solid follow-up. On this outing the band seems most comfortable in its shoes, and uses that confidence to travel more abstract avenues of expression. The strident opening statement in the title cut is a case in point, for its conventions quickly slide down a banister of drums into a groovy bass line, mere preamble to some wild conversation between Molvær and Brunborg, who rock that fulcrum with unrelenting conviction. (Note also their smoldering handoff in “Gaia.”) The latter’s gorgeous soprano brings out more of the same in “Lill’ Lisa” over some touch-and-go drumming from Christensen and Andersen’s echoing draws. Even subtler acts of sonic pension like “Heiemo, Gardsjenta” and “Find Another Animal” pull at frayed seams in delightful ways. “Little Song” is, in scope, anything but, expanding as it does far into the horizon of its intimacies. 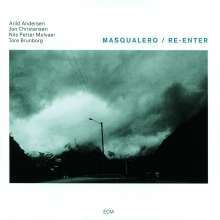 And if John Zorn’s Masada is your bag, then you’re sure to be delighted by “There Is No Jungle In Baltimore.” Masqualero crosses the finish line with time to spare in “Stykkevis Og Delt,” ending with a concoction that is equal parts elegy and tribute, as monochromatic and cloudy as cover photograph. I feel fortunate to have encountered most of Arild Andersen’s work in chronological order. Doing so has allowed me to witness with fair proximity the evolution of his craft. The sound of his amplified instrument here is thick and honest, at times unassuming yet more than willing to muscle its way to the top when needed. Due to its meandering nature, Re-Enter is as much about feeling as it is about the means of expressing it. It wants to emote rather than simply describe its stories, and this is what separates Andersen from the pack. A getaway for the heart, this one. Perfekte Aufnahmequalität für perfekte Musiker! Wie für mich nicht anders zu erwarten, ist dieses Album nur schon wegen dem sensationellen Schlagzeugspiel von Jon Christensen den Kauf wert. Zudem ist sowohl die Aufnahme- wie die Pressqualität vom feinsten. Musikstil ist zwischen groovigen Jazzrock-Geschichten und meditativen Jan Garbarek-Stücken. Zum Preis von 10 Euro sofort zuschlagen!